A completely unique Baum from Down Under that's custom in every way. 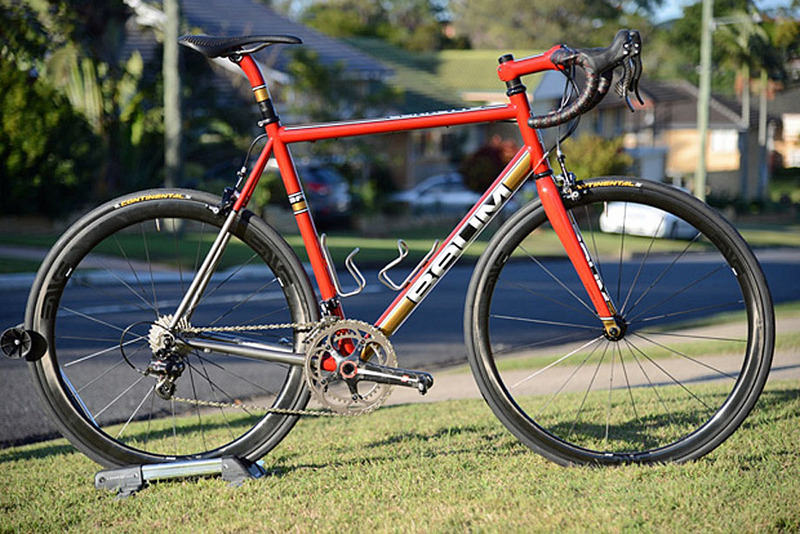 Stephen Amos in Brisbane, Australia has a very unique steed: A hand crafted Corretto by Baum, shod with a Campagnolo Super Record group and Enve wheels and finishing kit. A custom paint job classic look with a unique twist. It's Retro Readers' Rigs time! Saddle: Selle Italia SLR Superflow. Other: Enve bars, Stem, Fork, and. 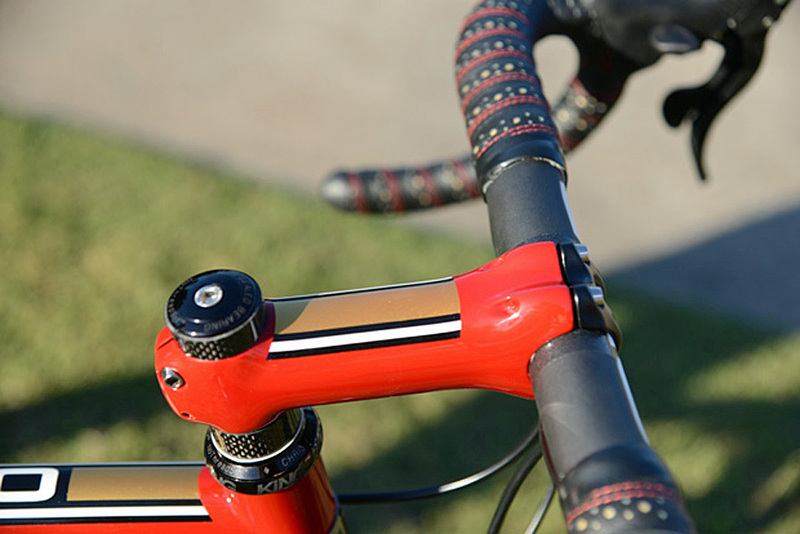 Custom bar tape and saddle cover by Mick Peel at Busyman Cycles. 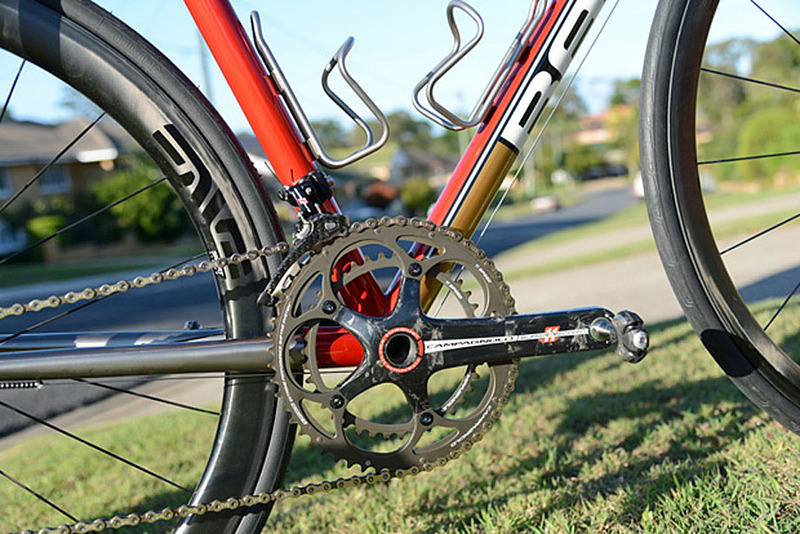 Weight: 7.16kgs with cages and pedals. It was ordered October 2012. I flew to Geelong for a fit and to discuss in March 2013, and the bike was delivered in August that year. I guess I've got a pretty standard story to many who ride. I started riding as a very typical obese middle age dude - and riding has transformed my health and life. I intend to ride for as long as I can - and I'm not a fan of our throwaway society so the idea of a bike built for me that will last had real appeal. I see a lot of people changing bikes every two or three years and I just wanted to go down a different path. It was quite a leap of faith ordering it, but the bike has exceeded my expectations in every way. 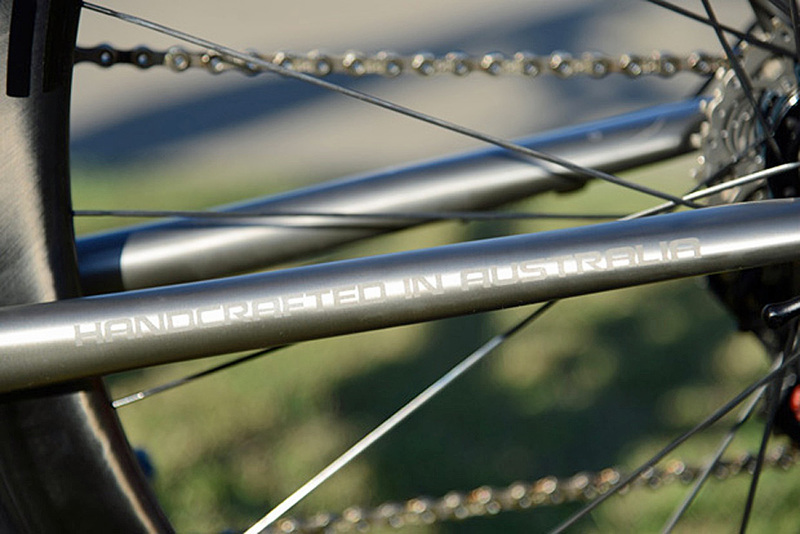 I'm proud to support an Australian company capable of this standard of craftsmanship. With Baum the whole bike is custom in every way so there aren't any modifications per se. I took the geometry of my existing bike to them and they used this as a base for their fit jig. Ryan Moody did my fit, and we then discussed what I wanted from the bike in terms of handling and looks. Next was colors which was really tough! All I knew was that I wanted it to look like my dear old Lotus Elan with its Gold Leaf Tobacco inspired color scheme. After pretty much a full day everyone in the office (Including Darren Baum) had a bit of a review of what we'd arrived at. There was some shuffling of feet at the "unique" colors but the bike was pretty much locked in from there. It was quite a memorable experience right down to the Friday BBQ lunch shared with their painters and machinists. 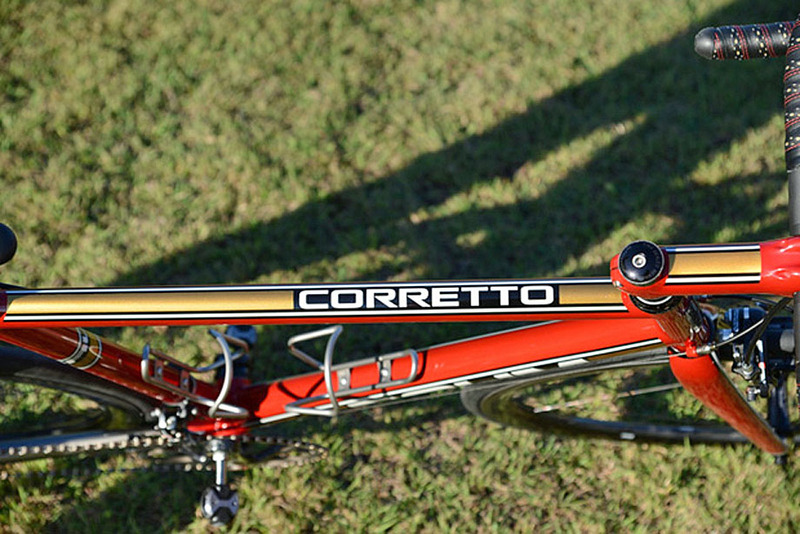 I knew I wanted to go with Campagnolo because of the ergonomics, longevity, and looks. I wasn't so interested in the complexity of electronic shifting so Super Record it was. Baum recommended the Enve wheels and I'm very glad I listened! Enve also did all the cockpit carbon components as I didn't want to mix and match and I wanted it all to work well together. I ended up so far in the hole on this one I could barely see the sun but I'm glad now it's paid for! I do around 12,000km (7,500 miles) a year, give or take. Those miles are mostly road, but I commute religiously and pretend to be a mountain biker when the opportunity arises. We're lucky here in Brisbane. We've got lots of hills and mountains nearby, some great flatland rides, and our famous "River Loop" which winds around our city. If I had to pick, I'd say my Thursday 80k bunch ride to the nearby seaside town of Redcliffe for the lovely views and great company along the way. 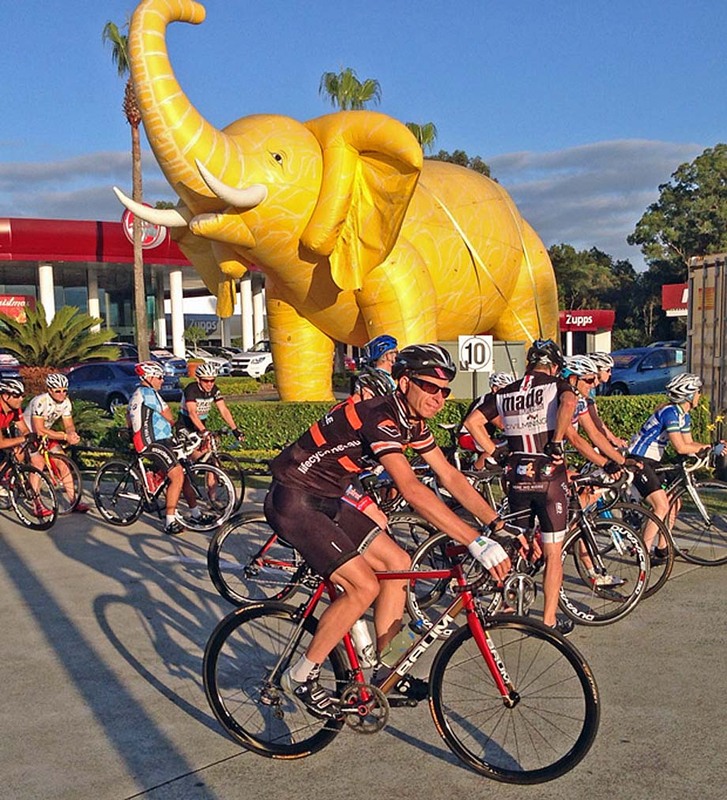 If you get up early enough in Brisbane you might just be able to share your morning ride with Steve and his beautiful Baum - or even a giant inflatable elephant! Every ride on the Baum is a treat. In Brisbane we ride really early and that means leaving home at 5am most times which can be hard. However from the time the Baum comes off the stand I know it's going to be theatre. 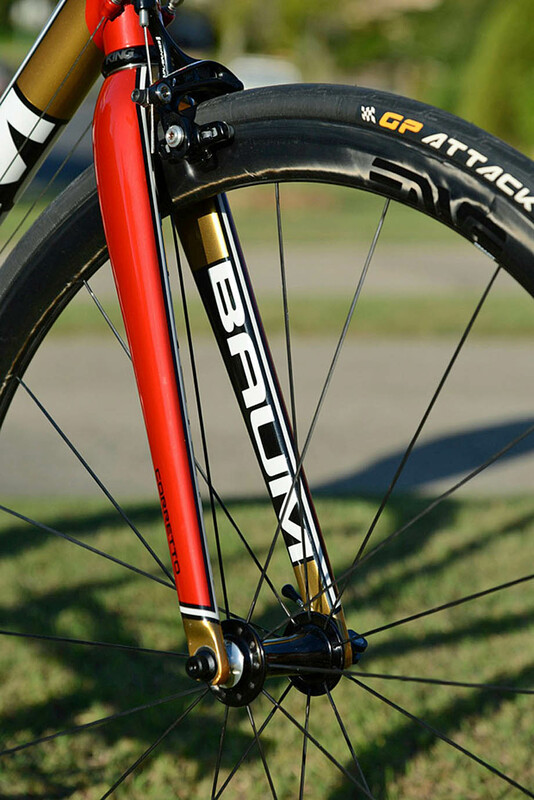 The hubs start buzzing as you wheel it out, the gold highlights catch fire in the morning sun, and then from the first pedal stroke the bike flies while it cossets you with a velvety ride. That's a treat every time - I'm totally smitten! Maybe in a five or ten years I'll send it back and give it a birthday repaint. Maybe I'll be persuaded to try electronic shifting by then! I'm saving heaps of money on cars now I'm into bikes. Got a bike that you're proud of? Well how about sharing it with fellow PEZ fans and getting it featured in Readers' Rigs so we can all stare at it! Send us a Readers' Rigs submission direct to [email protected] and your bike could be featured in all its glory here on the pages of PEZ.